Dr. Eric J. Topol was a guest on Comedy Central's popular late-night TV show The Colbert Report last week, discussing the collaboration of medicine and technology and its future. He even demonstrated life-saving procedures you can do with your smart phone. Using funny-man Stephen Colbert as his guinea pig, Dr. Topol monitored his heart rate with a cardiogram and inspected his eardrum with an iPhone. 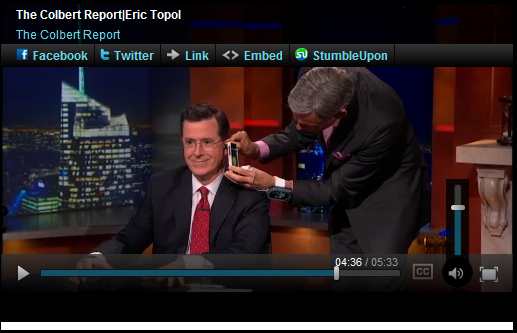 Dr. Eric Topol uses his iPhone to inspect Stephen Colbert's ear drum on The Colbert Report. True to form, Colbert interrupts the exam to ask, "By the way, can I get a colonoscopy with this thing?" Watch the video here. Dr. Topol (@EricTopol) is a world-renowned cardiologist, geneticist and medical innovator. During his 15 years at the Cleveland Clinic, his Department of Cardiovascular Medicine rose to No. 1 in the rankings of US News and World Report for 11 consecutive years. He is author of the Textbook of Interventional Cardiology, 6th Edition and The Creative Destruction of Medicine. To learn more about his work, read his bio on Elsevier Authors. A version of this article originally appeared on the Elsevier Authors website. 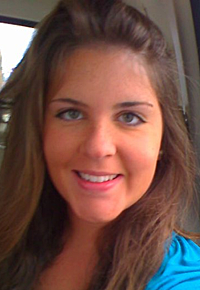 Shelby Livingston is an intern for Elsevier, serving as Search Engine Optimization Coordinator and Blog Marketer for Elsevier Authors. As a graduate from the University of Missouri-Columbia, she earned her degree in Business Marketing. She is based in Elsevier's St. Louis office.